Our December Holiday Food Fest continues with a post by Serena, who blogs at Savvy Verse & Wit, runs Poetic Book Tours, and is also a fantastic poet herself. She was recently nominated for the Pushcart Prize! Today Serena's here to share some of her favorite holiday cookbooks and comfort food recipes. Take it away, Serena! The year wraps itself up in December. Although 2016 may not have the shiniest paper and sparkly bow, December is the time for reflection, giving, and, yes, eating. On the east coast, the weather can be rainy or snowy, but almost always, it is too cold for me. My cousin keeps telling me to move to Florida, but that hot weather would leave little room for some of my favorite comfort foods – soup, chili, and shepherd’s pie. 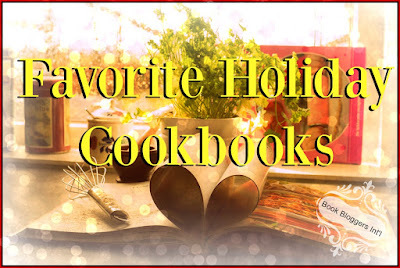 Book bloggers who love to cook gravitate toward cookbooks like children to candy. You can’t get enough. And look out if the latest cookbook also happens to be written by one of our favorite authors – Jane Green. What we really want is good food to warm the body and food that’s easy to prepare and share with family, friends, or even book club. Some of my favorite recipes are so easy that you just throw the ingredients into a crockpot, set the timer, and go read! Six Sisters’ Stuff cookbooks have a number of easy recipes, but one of our favorites is macaroni and cheese for the crockpot. It does require some prep; you’ll have to cook the elbow macaroni and melt grated cheddar with butter in a saucepan. Spray the crockpot with non-stick spray and add the ingredients. It only takes two hours to cook, so it can be made quickly in a pinch. It is so creamy thanks to the sour cream, milk, and cheddar cheese soup. My daughter would tell you that her favorite food is chicken nuggets, and Aviva Goldfarb’s SOS! The Six O’Clock Scramble to the Rescue has a super easy recipe with some healthy side dish suggestions. Buttermilk-bathed chicken nuggets are easy to make once you prep the buttermilk wash with garlic and the batter of bread crumbs, Parmesan, and seasoning. They take between 15-20 minutes to bake in the oven. But don’t forget to cut the chicken breasts in smaller sizes. We ended up using pre-cut chicken. It was delicious, and there were no complaints from a girl who thinks most food comes from a bag or box. What are some of your comfort foods? I'm always looking for new cookbooks and recipes to try.